Residents of the Houston Rd. and the Rutland Community are very opposed to the widening of Houston Rd. to 5 lanes. In 1994, the citizens in the Rutland Community were asked to vote yes on a 1% local option sales tax for road improvements. Prior to the vote, all information regarding Houston Road stated that it would be "improved" to 12’ lanes with turn lanes as needed. The members of the community agreed that Houston Road needed improvements; however, were opposed to a new road (Gap Road project) which would cut through a residential community. Opposition was voiced and an advertisement was placed in The Macon Telegraph that the new road would be deleted in it’s entirety. After the vote, many changes were made to the original road improvement program which was "sold" to the public. The improved 12 ft. lanes were increased to four 12 ft. lanes with a 14 ft. median and 2 sidewalks!!!!!! The minor widening project went from 22 ft. to 70 ft of concrete!!!!! The Gap Road project was reinstated under a new name. It is now called the Sardis Church/247 Connector. Imagine our surprise when we questioned these changes and were told that it was a "done deal" and that it was the "right thing to do". Previously documented traffic counts do not dictate the widening to 5 lanes. We asked that another traffic count be taken since serious flaws in the previous ones were discovered. Post Buckley was hired by the road improvement officials to redo the traffic counts and lo and behold the counts increased to almost 20,000 cars per day. These new figures were gotten by feeding the same old incorrect data into a computer and projecting into the year 2025!! Environmental issues are the most serious issues that we must address with the widening of Houston Rd. Severe drainage problems continue to plague downstream neighborhoods. A 50+ acre detaining pond is being constructed west of Houston Rd. However, the majority of the drainage problems lie east of Houston Rd and water from the road will not flow to the detention pond but straight to the already overburdened drainage systems. Air quality is also a very important factor that should be a concern to all Bibb County and adjoining communities. Macon will reach non attainment status within the next year. We do not want to become like Atlanta and lose all opportunity to improve transportation. The environmental assessment has many serious flaws. The most blatant flaw was the omission of Heard Elementary as a significant historic property. A recent review by the Department of Natural Resources granted Heard School national historic register status and forced the redesign of Houston Rd. Based on this review, the current let date has been changed to September 17, 1999. A final request to the Technical Advisory Committee asking for Walter Kulash to review Houston Rd. was granted. Upon presentation to the Executive Committee this request was denied. Mr. Joe Street of the Georgia Dept. of Transportation said that all funding would be lost if the project was further delayed. We have since learned that funding for the project could be rolled over to another year and would not be lost. We wonder why Houston Rd is the single exception in Mr. Kulash’s review. Continuous threats of "we will lose this money" has been heard since June, 1999. Why didn’t all members of the Executive Committee check to see if this was true? Since our pleas and documented evidence has been ignored, legal action is pending. To appease the concerns of neighborhood groups and build public trust, it was suggested Thursday that neighborhood-friendly traffic engineer Walter Kulash should help with the remainder of the $300 million city-county road improvement program. The idea drew initial support from Bibb County Commission Chairman Larry Justice, but ultimately it was shot down. "This is excellent," Justice said when Tom Moreland made the suggestion to the road improvement program's executive committee. Moreland is the principal engineer for Moreland Altobelli & Associates, Inc., the firm hired to manage the road program. Justice said Moreland's proposal goes "way beyond the scope of what we discussed at the last meeting." "This demonstrates that we're listening and trying to respond to public interest," he said. Last month, the executive committee, which Justice chairs, agreed to have Kulash review and make recommendations to the proposed Wesleyan Drive and Ingleside Avenue widening projects. Kulash, of Orlando, Fla., was to be paid $5,000 for his services. But Moreland's suggestion of bringing Kulash on board throughout the road program quickly lost its momentum. Frank Pinkston, an ex-officio member of the Executive Committee and the 8th Congressional District's representative on the state Department of Transportation board, objected to having Kulash's tracks on all future road projects. Pinkston said Kulash should only be brought in on other projects when the Executive Committee gives its approval. He prevailed. In recent weeks, various neighborhood groups have accused engineers at Moreland Altobelli of being calloused, aloof and uncaring about their concerns. The neighborhood groups pushed to involve Kulash because of his reputation of being sensitive to neighborhood concerns. Moreland told the Executive Committee that he wanted to "increase the scope" of Kulash's services and solicit his help throughout the road program. He also said he wanted Kulash to report all his findings directly to the Executive Committee. Moreland said he and County Engineer Robert E. "Bob" Fountain already had agreed on a contract for Kulash. After the meeting, Carson Flourney, who attended the meeting to oppose widening a downtown street, said he heard Pinkston tell Fountain that the executive committee would have trouble from him if Kulash is employed on projects other than Wesleyan and Ingleside. Pinkston could not be reached for comment. But Fountain said he understood that Pinkston merely wanted to see how Kulash handles Wesleyan and Ingleside before agreeing to let Kulash do anything else. "What I heard him say was 'let's get through Ingleside and Wesleyan before we go on with the rest of it,'" Fountain said. "Somebody else might've heard it differently, and I might have read between the lines a little bit. "But I felt that was the intent of what Frank told me." Traffic engineering consultant Walter Kulash came to Macon by request to do exactly that - to consult with the Road Improvement Committee and the road program's manager, Moreland Altobelli. For rendering that service Kulash received $53,000 and - most recently - a passel of criticism leading to investigations of him in both Georgia and Florida. For rendering his advice on how to make road expansion in Bibb County more palatable to its critics, Kulash suddenly appears No. 1 on the engineering community's most unwanted list. As we understand it the Florida Board of Professional Engineers is investigating Kulash to determine if he has engaged in conflicts of interest in Florida (where there has never been a complaint against him), presumably because the head of an engineering firm here decided the consultant was guilty of a conflict of interest in Georgia. That came of Kulash's testifying at a court hearing for CAUTION Macon, a non-profit group trying to stop the widening of Houston Road. Kulash was paid for his trouble by CAUTION. A similar engineering board in Georgia is on Kulash's case for being involved in a Georgia engineering matter without having a Georgia license. The question is whether Kulash's consulting work actually constitutes the practice of engineering. It's true that Kulash was in the employ of the other side when he testified for CAUTION Macon, and perhaps that's technically a conflict under engineering rules. But Kulash was giving his honest opinion. There's no reason to believe he would have testified otherwise if he'd been put on the stand by Moreland Altobelli or the Road Improvement Committee. Frankness is not generally held to be unethical or unprofessional. As for the license, it would seem that if Kulash's work in Georgia (he holds a Florida license) required one, Moreland Altobelli, which hired him, would not only have advised him of that fact but also have helped him obtain whatever document he needed. We don't know whether or not Kulash handled himself with impeccable professionalism. But at this point it seems the man's reputation is being unnecessarily sullied for insignificant reasons. Editors: A surprising controversy has arisen out of CAUTION Macon's suit against the Macon/Bibb County Road Improvement Program: the involvement of Walter Kulash, a nationally respected traffic system planner/engineer and an expert witness called by CAUTION. One suspects that this is an attempt to divert attention from the more substantive issues raised by the case, or another attempt by local officials to discredit Kulash. A citizen legitimately expects hired or contractual professionals paid with public funds to promote the public interest. Unfortunately, professionals hired by the Road Improvement Program are forced to act as political operatives, loyal to a political boss rather than to the general interests of the taxpaying public. Their recommendations support the "cause de jour" and change with the political winds (witness traffic counts). This is the price of eligibility for public contracts in Bibb County extracted from these individuals and firms. Kulash reflects what is best in the profession - a man who honors his professional commitment to the public that pays him. He saw no conflict in his allegiance, as his professional opinions have been constant. Unfortunately, we have created an environment where an honest professional is placed in the unholy conflict of choosing between the public interest for which he is ostensibly hired, and loyalty to the narrow interests of the political operatives who sign his paycheck. In this environment, Kulash is an embarrassment to his local peers - as a professional willing to act in the public interest. In so acting, Kulash brings the competence and credibility of local "professionals" into question. As is often the case, a good and moral man makes less dedicated or principled men look bad in relief. We must do what is necessary to keep Kulash engaged in saving Bibb County from itself! 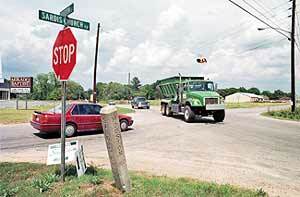 Roads program OKs 5-lane Houston Road 1-99 ? vs. MACON, GEORGIA, et. al. It's now up to a federal judge to decide whether to stop the widening of Houston Road from two to five lanes. Attorneys for federal, state and local transportation offices closed their case Friday in CAUTION Macon's attempt to stop federal funding for the road project. CAUTION Macon, an organization that has questioned the project's scope, contends an environmental assessment used to approve federal monies was not completed properly. Attorneys for the road builders limited their case to three witnesses, canceling at least four more to speed up proceedings. Federal district court Judge Duross Fitzpatrick said Friday evening he will decide the project's fate after a full transcript of testimony has been completed and briefs from both sides are filed. The briefs deadline is Jan. 28. Fitzpatrick did not estimate how long he'd take to reach a decision. Work on the widening, meanwhile, continues. "I'm not prepared to issue a ruling this evening," Fitzpatrick said. "This is one I want to get right if I can." A ruling in favor of CAUTION Macon could suspend federal funding for the project, which could end the five-lane widening. A ruling for the defense will allow construction to continue. The majority of Friday was spent with attorneys questioning Federal Highway Administration employee Faye Dimassimo, an assistant division administrator in charge of federal road projects in Georgia. Dimassimo's office was responsible for compiling information used in the environmental assessment. CAUTION Macon believes the study didn't fully address quality of life, air quality, drainage and traffic concerns, and that an environmental assessment should have been completed for the entire Macon-Bibb County Road Improvement Program. Dimassimo testified Friday that drainage concerns from the road improvement will be corrected with a gutter system. She said Macon is under no federal air-quality restrictions that might restrict the widening project, adding that Atlanta is the only such city in the state. As for an assessment of the entire program, Dimassimo said Friday it would not be helpful. "At that point, (local transportation offices) are still dealing with the conceptual level," she said. "Real environmental consequences are difficult to define then." Dimassimo said if the environmental assessment had shown considerable hazards from the project, then a more complete document called an environmental impact statement would have been completed. In the Houston Road case, this was not done because the assessment showed no significant impacts on the surrounding community. CAUTION Macon witnesses suggested Wednesday and Thursday that three lanes would be sufficient. Dimassimo also countered this. She said a three-lane option was not considered because it would not address a high accident rate and projected traffic in 2025. More than 25,000 cars daily are expected on Houston by then. "There are always many other alternatives people can look at, but in this case, given the accidents and the projected traffic growth, my own opinion is that (five-lanes) is the best solution in the corridor." Defense witness James Evans, a traffic consultant who computed the traffic projections, agreed with Dimassimo's testimony. He said more than 70 accidents were reported in 1996, with 30 percent of those being rear-end collisions. "Three lanes does not solve the rear-end collisions from those making right turns," he said. "You'll still have backed up traffic with three lanes." Evans said a middle turn lane will be used by traffic from both directions to turn left. The outside lanes can be used for right turns, leaving the middle lanes for free-flowing traffic.